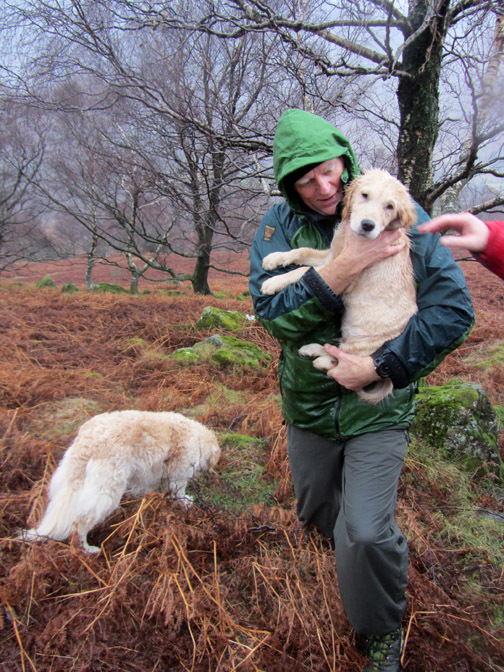 " Finlay of Borrowdale "
Date & start time: 13th December 2013, 11.30 am start. 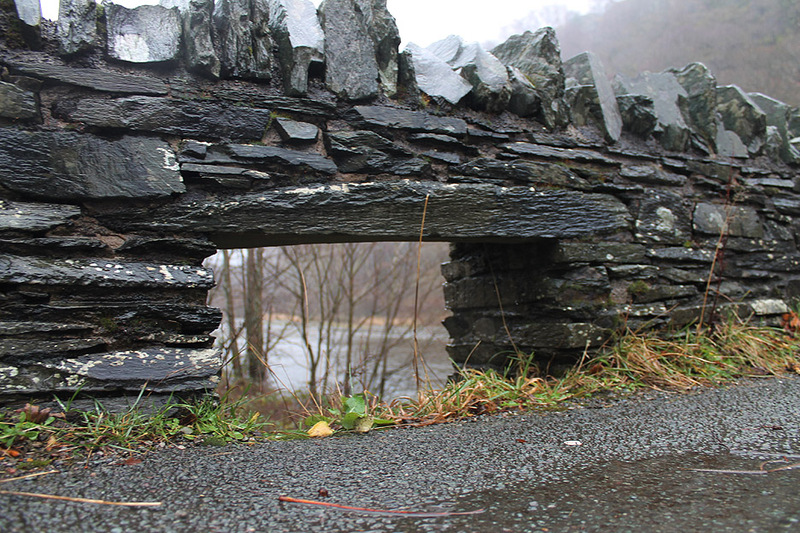 Places visited : Grange in Borrowdale, Cummacatta Woods, Grange Crags and back. Walk details : 1.6 mls, 390 ft of ascent, 1 hour. Highest point : Grange Crags, 630 ft (139 m above sea level) 350 ft above the river. 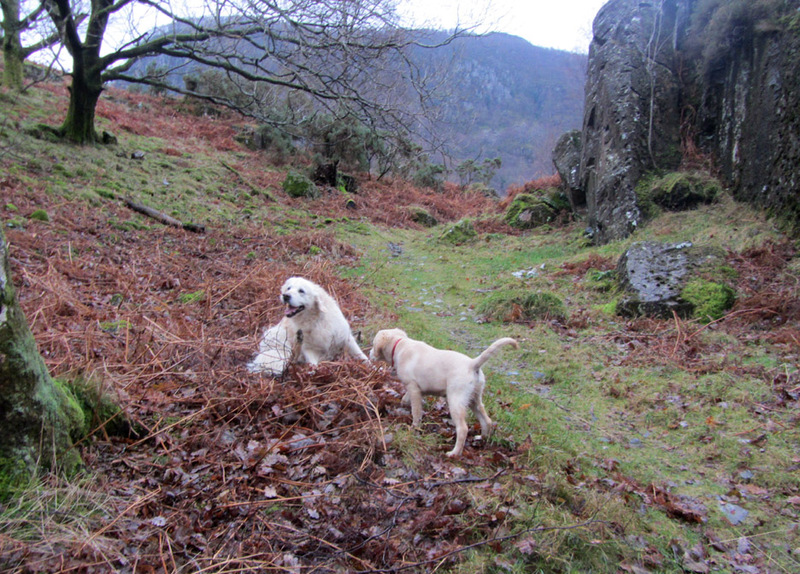 Walked with : Trevor and Gill, Ann and the dogs, Finlay and Harry. Weather : Changeable, deceptively dry to start, wet to end. 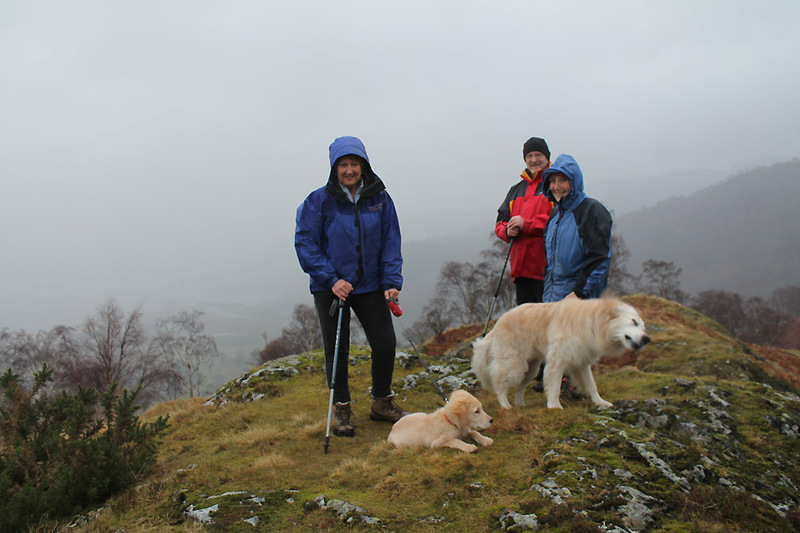 We had an invite recently from a couple who live in Grange in Borrowdale. 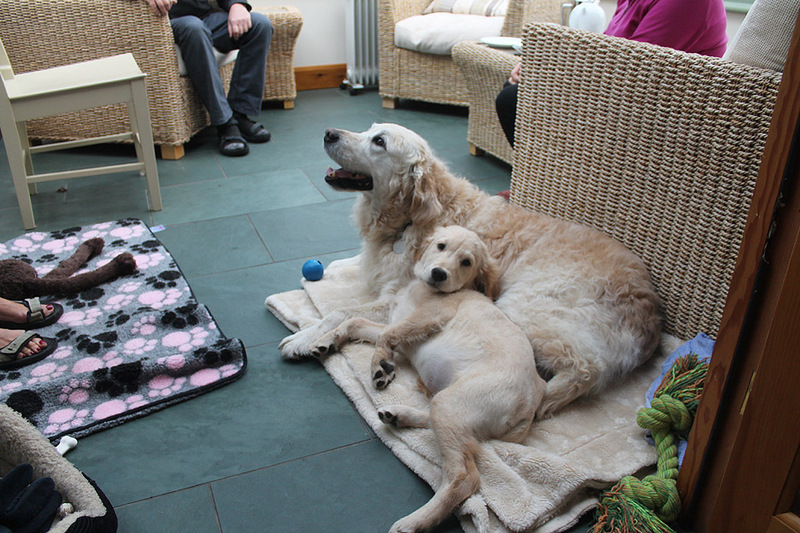 They have followed our website for a while and have recently acquired a young puppy. 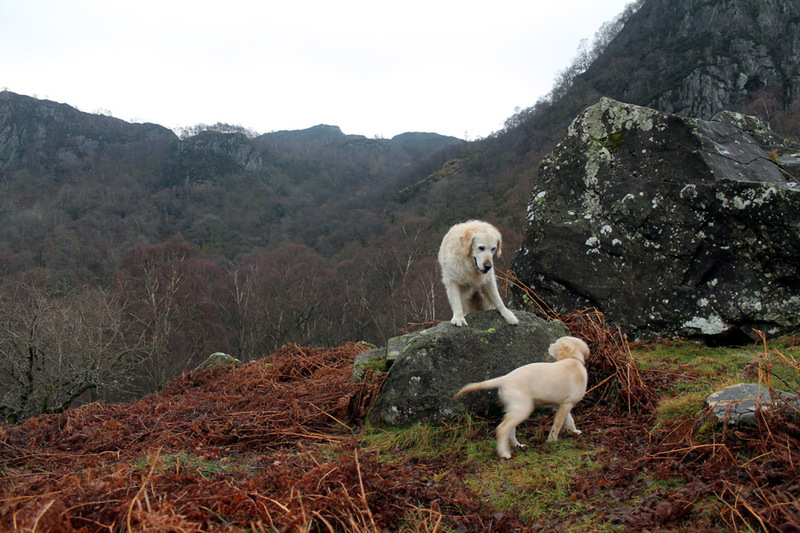 They needed a good fell dog and what better choice than one of those golden fluffy things ! 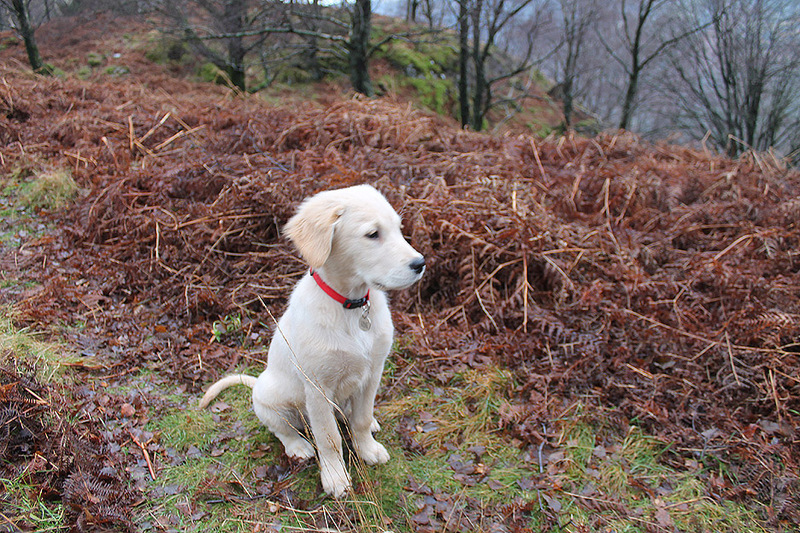 Meet Finlay . 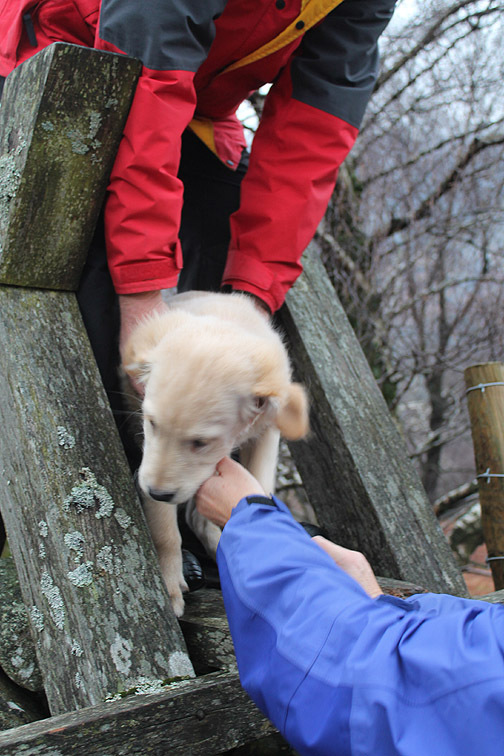 . . a sixteen week old Golden Retriever puppy ! 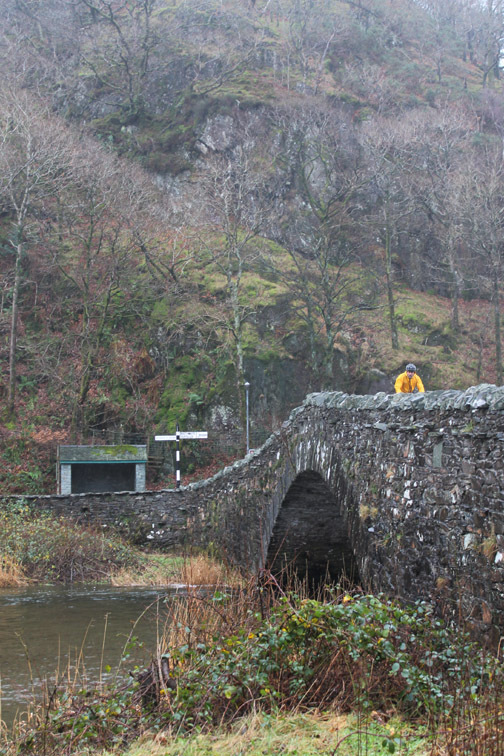 and we started our walk today at the double-arched slate bridge over the Derwent River. The weather was dry but rather grey . . . and the recent showers that left puddles on the road have moved away down the valley. The second of the two arches as we cross the river . . .
. . . and enter the woods on the opposite side. 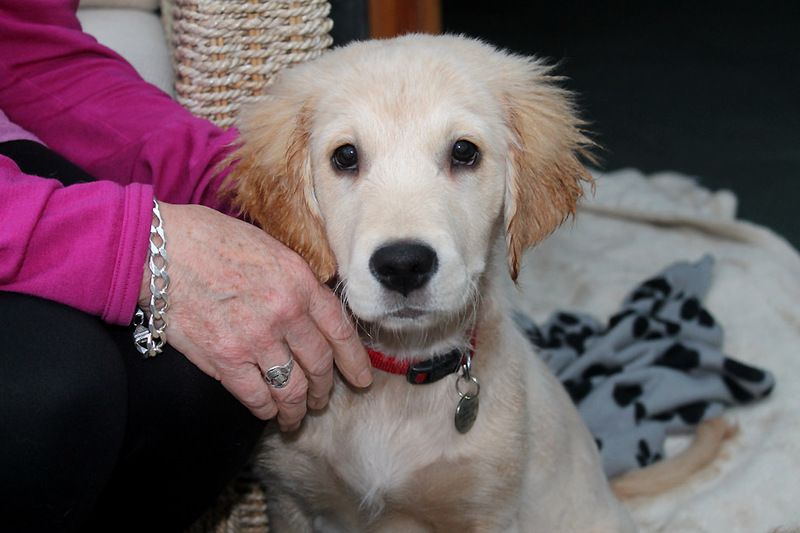 Finlay is full of fun, a really bouncy young puppy . 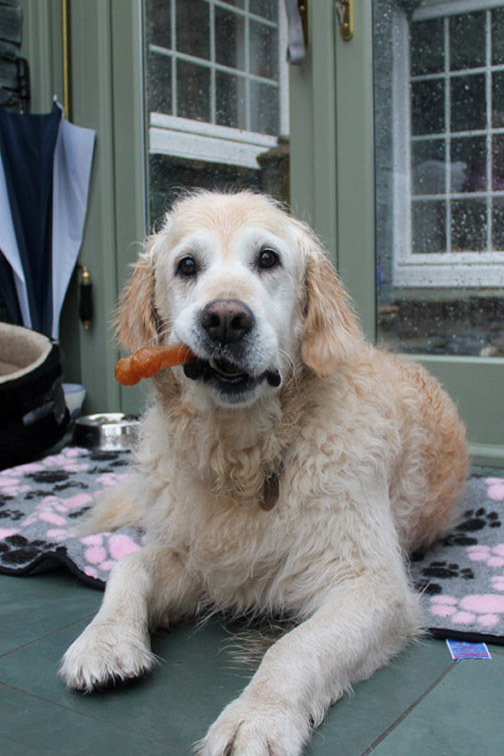 . . and brings out the puppy in Harry, albeit the nine year old side of his character ! Hold your cursor over the picture to join in. A view back up Borrowdale of Castle Crag and Nitting Haws rocks on the side of Maiden Moor. 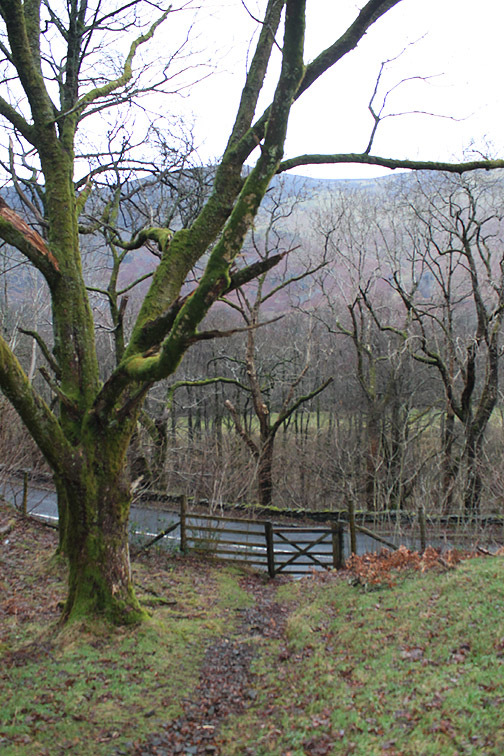 The trees in the foreground and to the right go under the lovely name of Cummacatta Woods. On a large fallen boulder under the Greatend Crags of Kings How is the "King of the Castle"
Finlay lacks the co-ordination to perch on the top with Harry. He's happier at ground level. Mmm . . . crazy ladder stiles . . .
. . . who ever invented these wasn't a dog ! heading for a new minor summit for Ann and I, that of Grange Crags. The cloud is above the fells but only just. 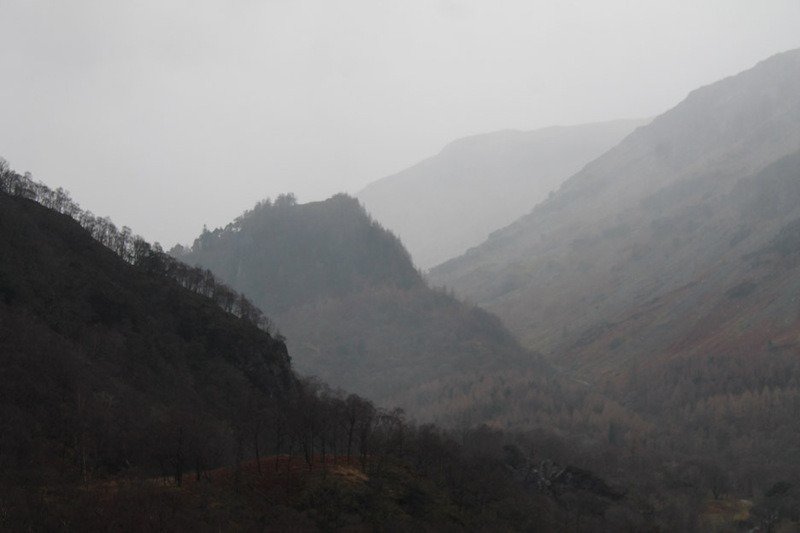 Castle Crag seen through the zoom lens.
. . . and I left my waterproof over-trousers back in the car ! Raining now on the summit of the crags. and Harry has a quick shake to get dry, the way that dogs do. 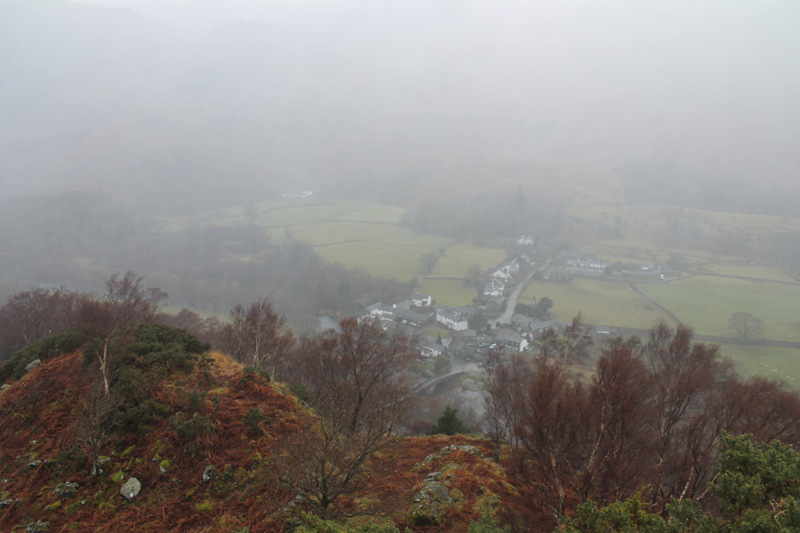 Looking down on Grange in Borrowdale, directly below us from here. 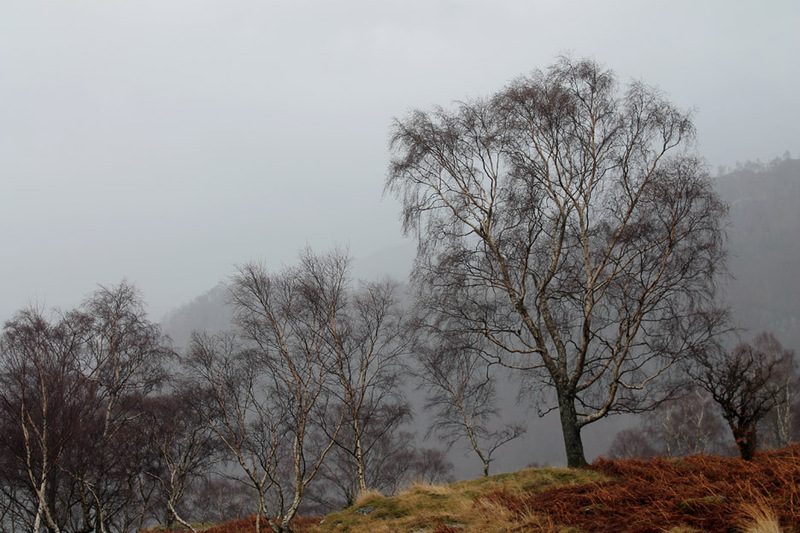 Silver Birch set against the grey sky as the rain shower passes on down the valley. 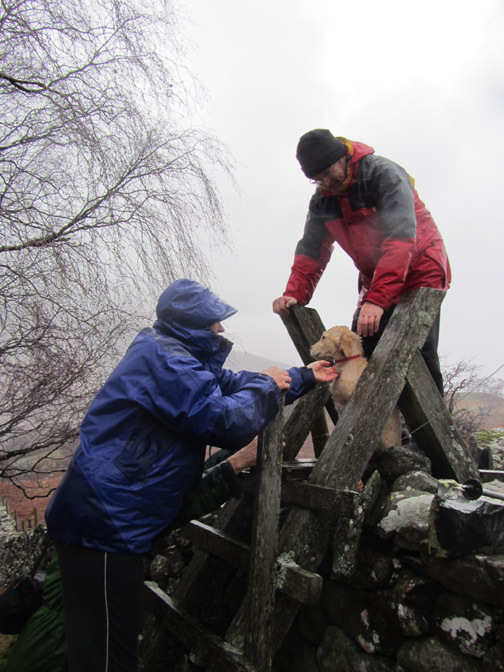 Finlay is as impressed as last time he crossed the stile. 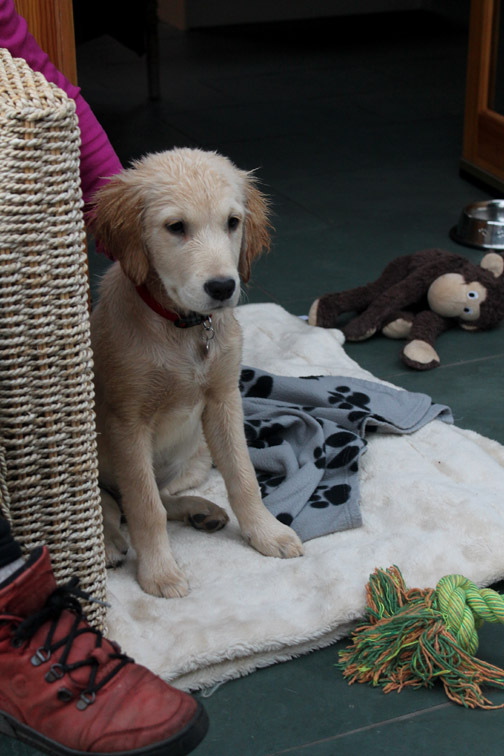 A little tired and a little wet for a young puppy. Back at the village as we cross the second of the two bridges. Time for a little mid-day nap . 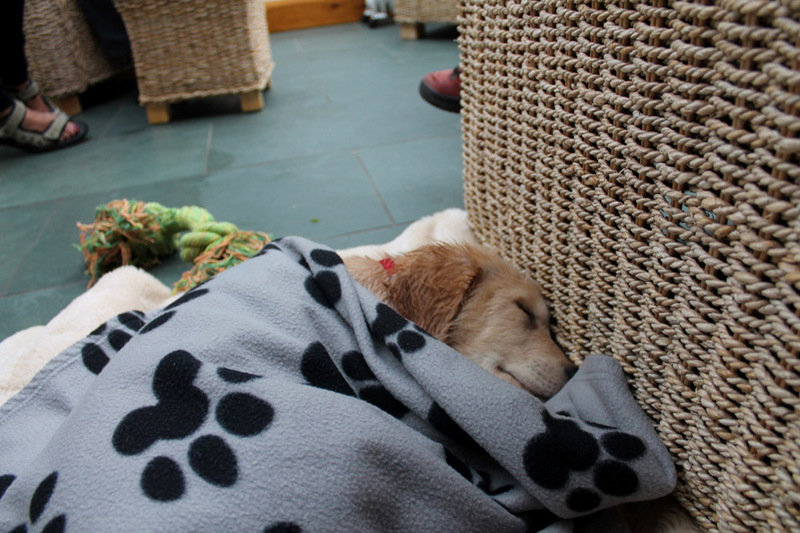 . . it has been a long walk for a little pup. 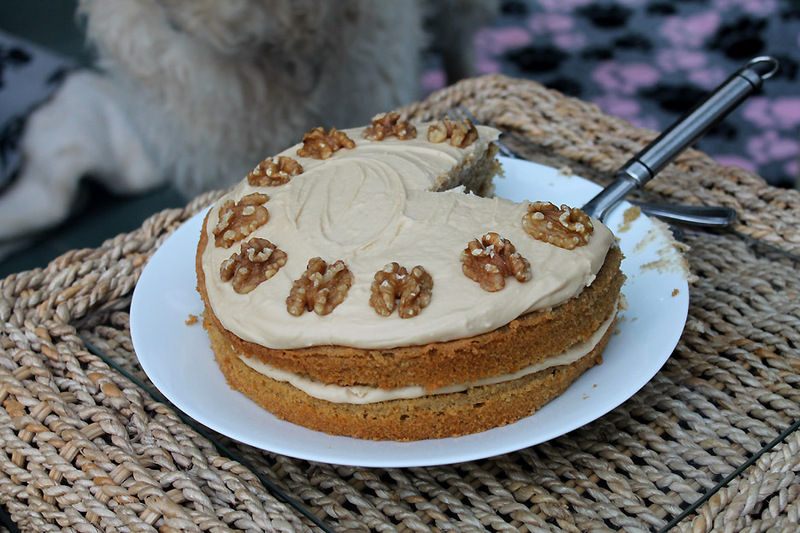 Not even for a fine lunch and a Walnut topped sponge to follow ? 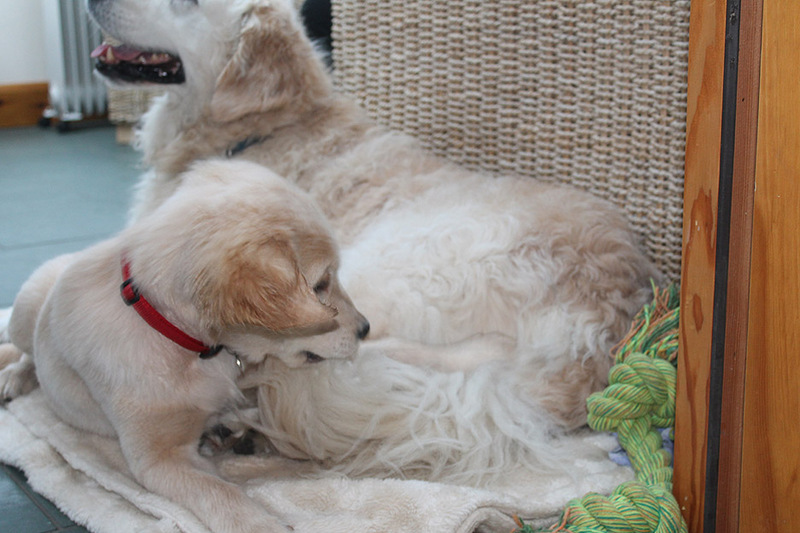 Harry has found a basket of toys . . . but they are not his. It doesn't mean that he can't share ! Oh . . . good afternoon Finlay . . . did you have a nice sleep ?
" Not my best shot . . . I've only just woken up ! " 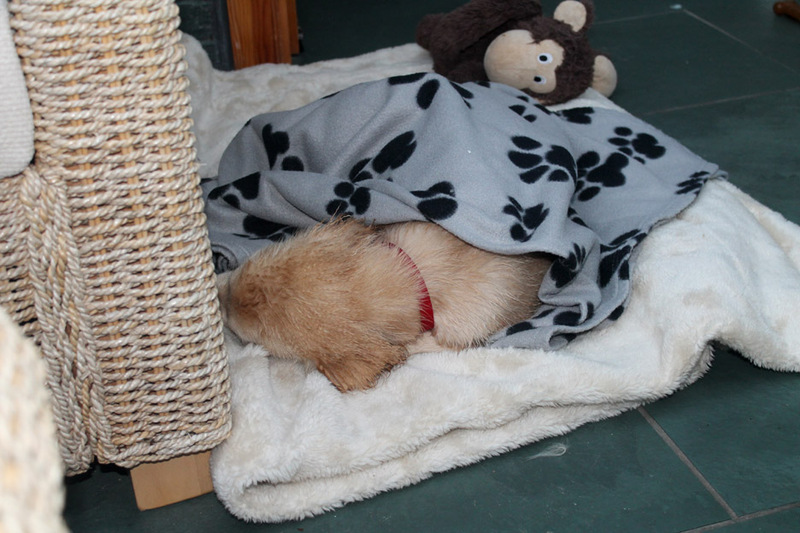 The grey slate isn't too bad but a blanket is much more comfortable. 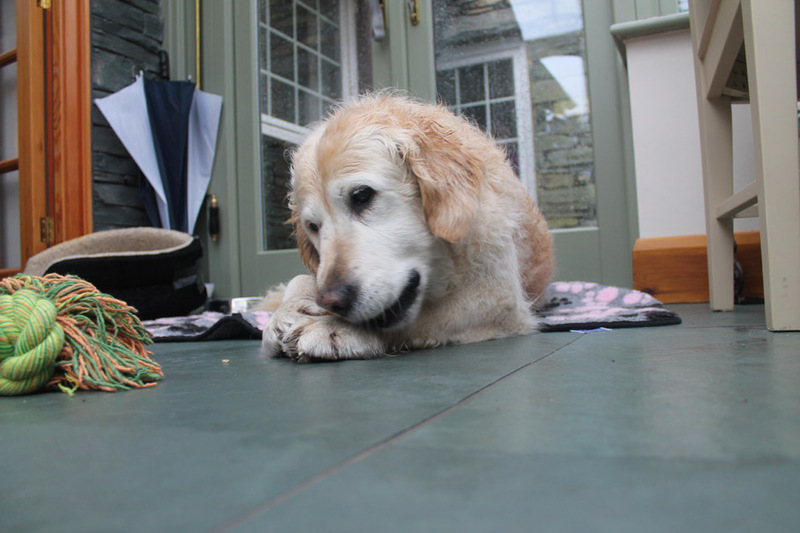 Finlay has found a new fluffy toy to play with . . . Hold your cursor over the picture to watch him play. 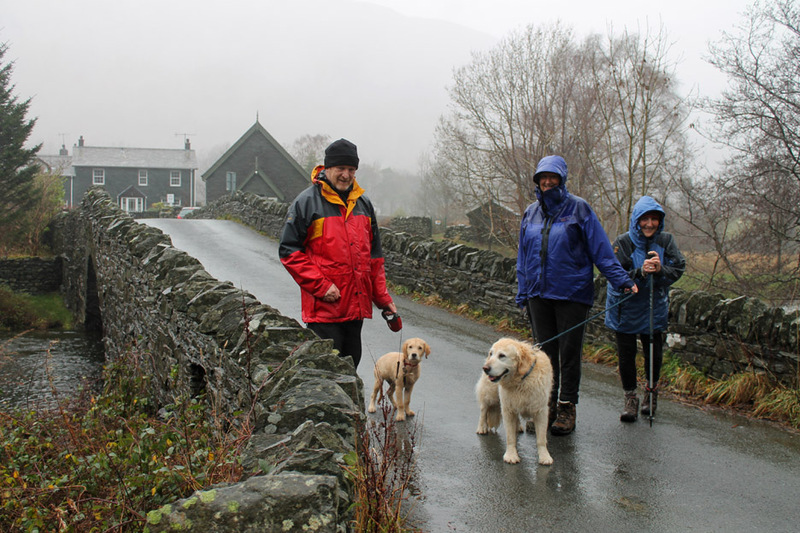 Time to chill out as we chat with Trevor and Gill about their move to the Lakes and how they have found living in Grange. 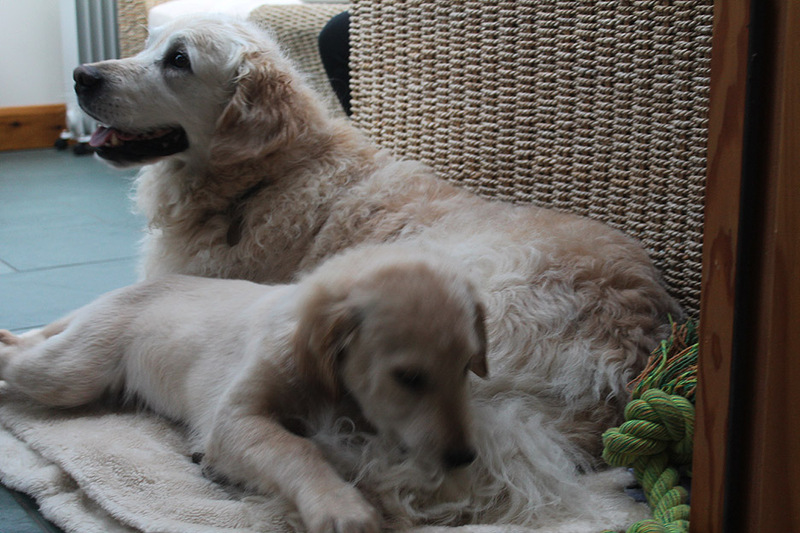 Hopefully we'll meet up again soon and Harry and Finlay will be able to have more walks together . . . in slightly better weather. This site best viewed with . . . a pair of borrowed trousers while mine dried out !